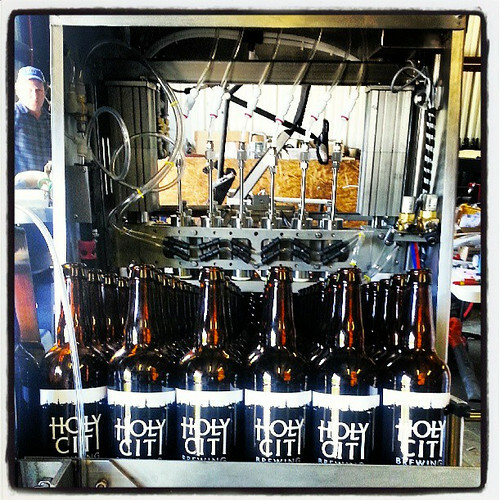 Holy City readies new bottling line | Drink. Blog. Repeat. For now, if you want to take home a bomber or 750 of Holy City‘s growing slate of beers, you’ll have to make your way down to the brewery itself and pick some up in person. But in the near future, you’ll be able to find 22-ounce bottles of Holy City brews around the Holy City itself. About a week ago, the brewery received its new bottling machine and on Tuesday gave it a test run with bombers of their Pluff Mud Porter. (Hmm .. that label design looks familiar.) There’s no word on when it’ll be operational, how many bottles they’ll be able to produce and when you’ll see the finished product, but all of those details will certainly be announced when everything’s up and running. The machine will be filling 22s for the time being, but six packs are planned for the future. The greater Charleston area should begin seeing bottles around town soon. No word on expansion outside of the Lowcountry, but those of us in Columbia (and I’m sure Greenville) will keep our fingers crossed. Pingback: Holy City Pluff Mud returns to bottles | Drink. Blog. Repeat.